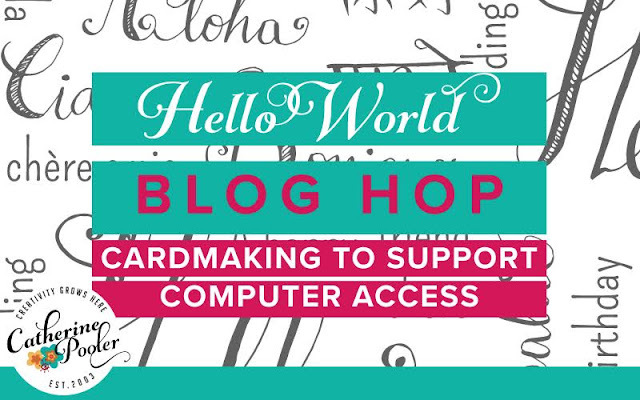 Hello, and Happy World Cardmaking Day! I hope you have some fun crafty plans! I'm so honored to be participating in a blog hop fundraiser today with Catherine Pooler, Chaitali Narla, Jennifer Ingle, and lots of other talented stampers. I love a good opportunity to help out right in my own community, and that's what this is. You probably already know Jennifer Ingle, fellow stamper in our beloved card making community. Her husband, Sean, is a teacher and is raising money to purchase computers for his new and underfunded classroom, so that kids who can't afford a computer of their own will still have access to technology. To read more about his campaign, visit his fundraising page. Catherine and Chaitali have collaborated to create a special stamp set, Hello World, just for Sean's fundraising campaign. All profits from the sale of this stamp set and the coordinating dies from Saturday October 1 - Friday, October 7 will purchase computers and other school supplies for Sean’s classroom in Boston. 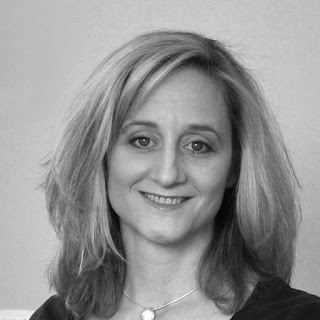 I especially love Catherine's story of how the collaboration came about! And I love Hello World, designed by Chaitali. Just beautiful -- especially all the languages represented! In the background I stamped hello in all the different languages. 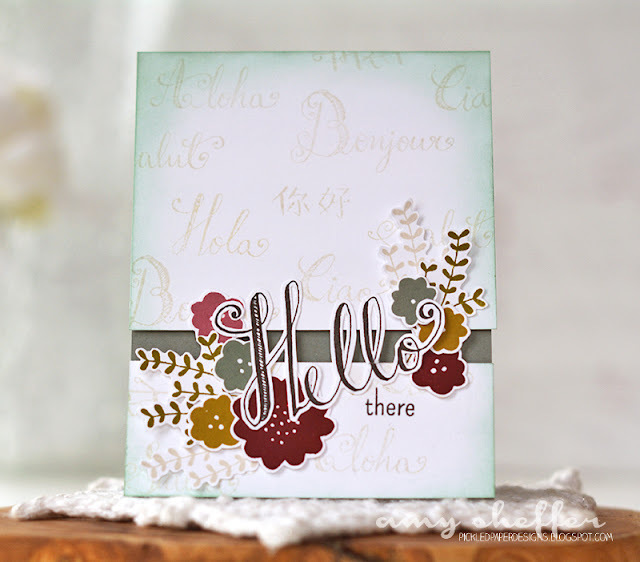 The focal point is the giant script "hello" surrounded by pretty flowers from the Lovely Flowers stamp set, which is part of the Lovely Notes Collection by Catherine Pooler Designs. The warm, rich, autumn tones feel perfect for the cooler weather that seems to be arriving finally! great card. Love the way you did the background. And all the "fussy cutting"--wow, you have way more patience and talent that I do! I already ordered the dies with the stamps! Beautiful card. I do a lot of fussy cutting myself. Wonderful job on card. Gorgeous!! Love the design and the colors are so pretty! Fussy cutting can be a little relaxing. Amy, this is GORGEOUS! Such a pretty card! Thank you so very much for being a part of all of this! I so appreciate you taking the time to participate to help out Sean's students! 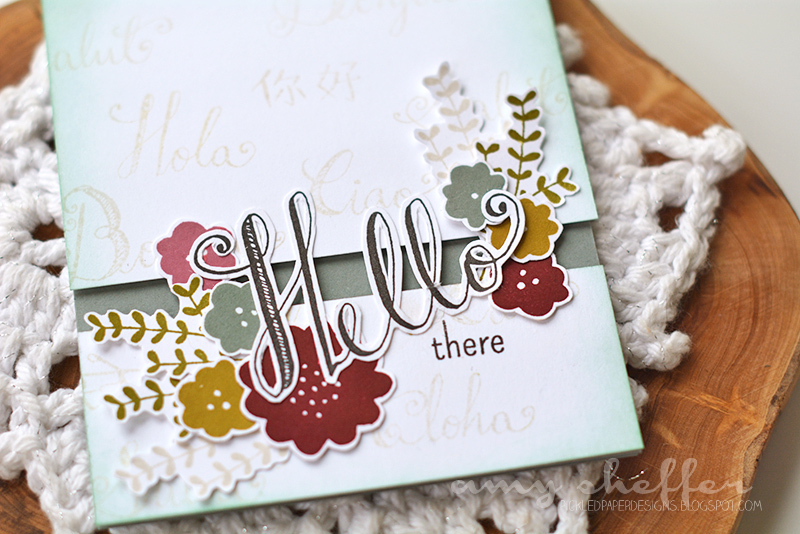 Love how you combined the different sets--such a gorgeous card, Amy! Amy, the Lovely Notes flowers stamped in Autumn colors are beautiful. I wouldn't have thought to do that. Thank you for being a part of this special blog hop for the kids! You color palette is very soothing! Very pretty card. Love it. I always love your work, this card included! This card rocks! I love the unusual colour of the flowers!! Nice fall touch to the card. Awesome card with such a beautiful background! Love the colors. Beautiful card. Very pretty! I love how simple it is yet so pretty!!! Being able to help kids get the tools they need to succeed is an awesome feeling!!! TFS! I really like the fall feeling to your card. It is so pretty, yet simple. Great background - wonderful card! Hope you are able to stop by my lil ole blog too! Thanks for joining in this great cause, so happy to be able to do this as well!!! I love your card! Love the fall colors of it! This is so gorgeous! LOVE the fall colors!!! This is so pretty, Amy! I love the rich autumn colors you've used! Beautiful! This card is so lovely. The layout, the colours, everything comes together to make a great card! is faster and easier to use a die. Love the subtle shading on the background. Like everyone else said - - really, really nice. I like the autumn colors. I like how you used the other languages of hello, but muted on the background. Beautiful card. I didn't buy all the hello stamps but after seeing your background, I think I need them. Such a lovely and elegant card. I love it. Thanks for sharing it. Love your card! I am so excited about using these stamps and dies! Can't wait for my order to arrive! Amy, love your gorgeous card! The addition of the blooms is perfect! This is incredible! I love all of the layers and your fussy cutting! And I love the color scheme! What a pretty fall card! I love the background stamping! Really nice layout! I like your color choices. I love to fussy cut. It gives me a sense of calm. I love your ur card. Great design. Lovely card thanks for sharing. 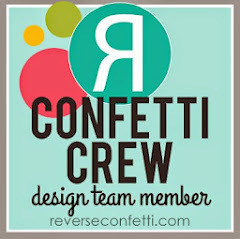 Countdown to Confetti - Naughty or Nice?